Guest House Naples Chiaia 32 is a residence located in a renovated palace in the heart of Naples. Its rooms are comfortable, well furnished with all comforts. 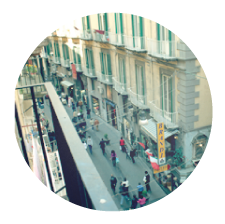 Guest House Chiaia 32 Naples is situated directly on the famous Via Chiaia, One of the most 'ancient and famous in Naples, pedestrian area and reference point for shopping Neapolitan. All the rooms have private toilets, with LCD wall, safe, hairdryer, orthopedic mattresses, independent air conditioning (available in Rooms Orchidea and Camelia). Within 200 meters from the residence you can admire the most famous tourist spots in Naples, Piazza del Plebiscito with the Royal Palace, the Real Teatro di San Carlo, the church / the Church of San Francesco di Paola, the Galleria Umberto I° and the ancient Via Roma / Via Toledo, another goal of shopping. At 500 meters you will find Castel Nuovo (Maschio Angioino), the marina, from where ferries depart daily for Capri, Ischia and Sorrento and the Castel dell 'Ovo with its Borgo Marinaro where you can enjoy the best fish in Naples at the most famous restaurants overlooking the sea. Right in front of Naples Chiaia32 BB is also the most famous Neapolitan Pizzeria, Pizzeria Brandi, where Pizza Margherita was invented in June 1889. Chiaia Deluxe Residence is a residence located in a historic building of the 'nineteenth century and overlooks the famous Via Chiaia. The studios at Residence Chiaia Deluxe are designed to give maximum comfort to the guests and they are all equipped with private toilet, smart tv 40 "wall-mounted LCD with satellite channels in the clear, seeker free wifi, safe, hairdryer, orthopedic mattresses, independent air conditioning, underfloor heating with energy saving, soundproofing, kitchenette with induction plates, refrigerator, freezer, coffee maker and tea, free national telephone calls, complimentary toiletries in the bathroom. Each studio is a monument, an icon or a peculiarity of the city of Naples and its territory.